Welcome to the culinary cutting edge. Explore everything culinary related on our pages and check out the latest issue of our online magazine, Food and Beverage Today. If you are looking for real a real restaurant experience from real Chef's that are in the business you have found the right place. Whether you are here to explore recipes or find out more about cooking or you dream of becoming a top Chef we are here to guide you and give you the information you desire to keep you on the culinary cutting edge! Here we will be focusing on key operational aspects of the profession, focusing on running a kitchen, controlling food cost, tips and techniques, new products, and trends. 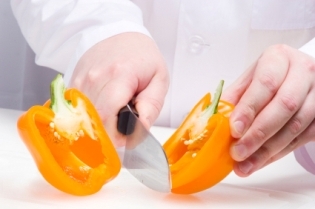 Our aim is to keep you on the 'Culinary Cutting Edge' of the business. Another key part of the Culinary Cutting Edge section is our Chef Spotlight where we will be selecting a different chef every week to highlight. We want you to be involved in this with us as every week the Culinary Cutting Edge will submit our top ten to our highlighted Chef. What is the top ten? The top ten is a list of questions submitted by our members. Just go to the form below (join our group first) and submit a question for the next featured Chef. This is your chance to get those burning questions answered. From what is the best thickening agent to what do chefs really like to eat when they are at home cooking we will show you! The top ten questions will be given to the highlighted Chef and will be a fun addition to the profile. But that is not all you will learn from our Culinary Cutting Edge Chefs, you will also find out: How they perceive the f&b industry as a whole, how they got into the business, where they went to school, the road they took to get to where they are, and what they are doing now. The highlighted chef will also be given the opportunity to share his/her knowledge of the industry, their skills in the kitchen. and their favorite recipes. These features will sure to keep you all on the Edge!